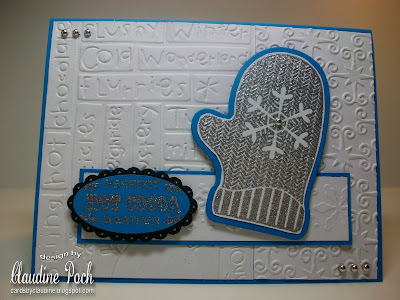 I made this card with my new "Winter Mittens" stamp set by Gina K Designs and coordinating Spellbinders mitten dies. I embossed the sentiment and mitten with silver glitter embossing powder. I always find it difficult to photograph silver and/or glitter on cards. The sentiment says "perfect hot cocoa weather." 3. 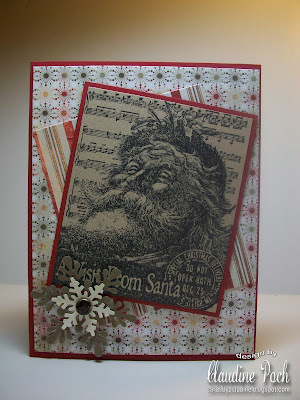 I Did It Creations- something new- I used my new stamp set and dies. 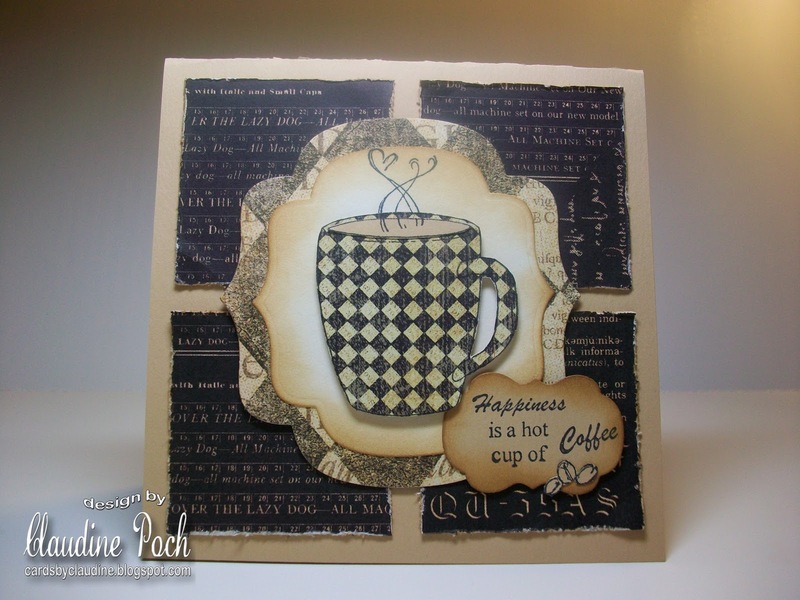 I made this card with my new Gina K "Mugs & Kisses" stamp set. This is the first set I have ordered from Gina K, and I love it! I used Graphic 45 papers for the card and for the paper piecing of the mug. 2. Splitcoastampers F4A45- celebrate those resolutions. I would like to take more time to have coffee and conversations with my friends in the new year. I made this card for the "Celebrate" challenge at the Crazy 4 Cocoa Challenge Blog sponsored by Sweet n Sassy Stamps. The sentiment is from Mark's Finest Papers. The Cocoa the mouse image is a digital image from Sweet n Sassy Stamps. I used the colors for this week's Curtain Call color challenge #62: Pear Pizzaz, Early Expresso, Baja Breeze, and White. This is a great color combination. 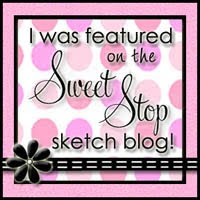 The sketch is from Mercy's Tuesday Sketch Challenge MTSC106. Note that this is her final challenge. 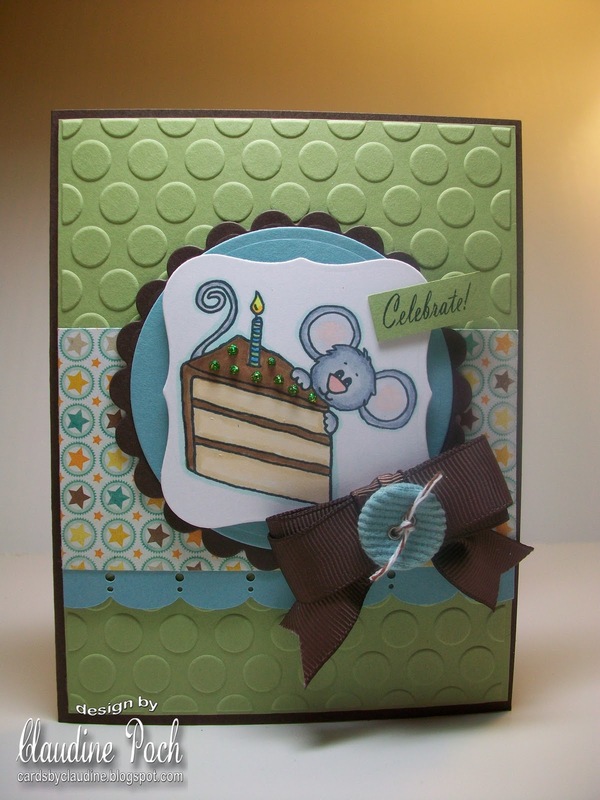 Stampin B's are also having a celebration card challenge this week. I made this card with a free Happy New Year Anya digital image from The Greeting Farm blog. I don't normally make New Year's cards, but I thought it might be fun to make one or two this year. The papers used are Bermuda Bay from Stampin Up and patterned papers by My Mind's Eye. The ribbon is also Bermuda Bay from Stampin Up. I made this card for the CAS99 challenge at Splitcoastampers. We were to make a clean and simple card using Wild Wasabi, Crumb Cake, Chocolate Chip, and White. This is a great color combination! 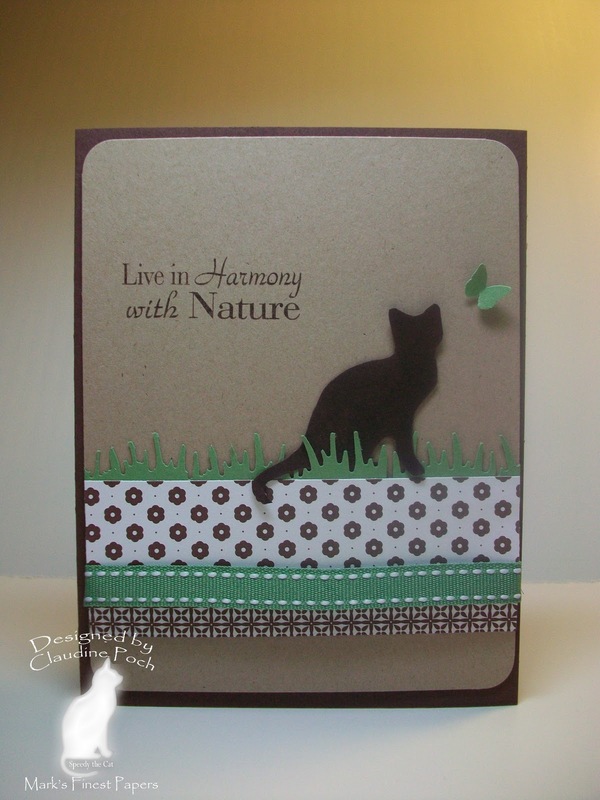 For my card, I used a cat silhouette and sentiment from Mark's Finest Papers. I used Martha Stewart punches for the grass and butterfly. The green card stock, as well as the ribbon are Wild Wasabi. 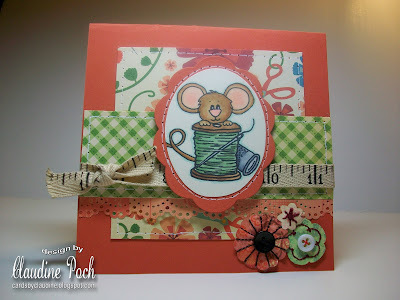 I am also entering this in Stampin B's #90 ribbon challenge. I just got this sweet coffee-themed Cocoa the mouse stamp set in the mail the other day and couldn't wait to ink it up. The stamp set is from Sweet n Sassy Stamps. There are several different sentiments you can stamp onto the coffee cup. 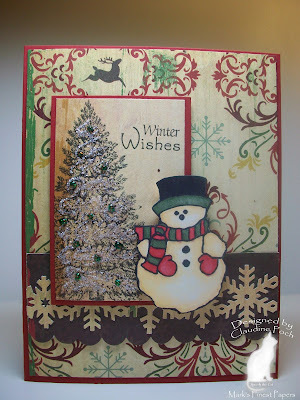 I made this card for the Crazy 4 Cocoa color challenge #4 sponsored by Sweet n Sassy. We were to use red, blue, and brown. I used patterned papers from Cosmo Cricket which contain red and and blue. I used Early Expresso card stock from Stampin up. Cocoa is also colored brown, as is the flower I made from a recycled coffee sleeve. I made this card for a split negative technique challenge at Stamp TV. I used a DP Artworks stamp of the Cincinnati skyline. I am unsure of the manufacturer of the sentiment stamp. I picked it up at a used stamp sale at a local stamp store. I figure since I live in Cincinnati, this card would be appropriate to make. I also entered this card in Splitcoastamper's CC302 challenge-red, black, and white. I made this card for two challenges: Splitcoastampers TLC304- use real or faux stitching, and SSS88 Sweet n Sassy's Sweet Stop Sketch Challenge. 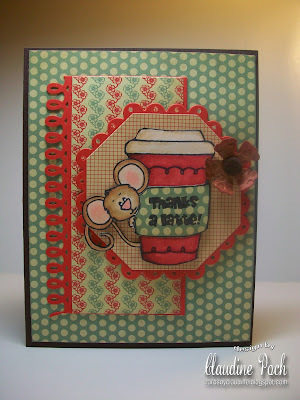 For my card, I used a Cocoa the mouse digital image from Sweet n Sassy Stamps. I colored Cocoa with Copic markers then framed him with Nestabilites dies. The papers used are Stampin Up's Dusty Durango and patterned papers by Cosmo Cricket. 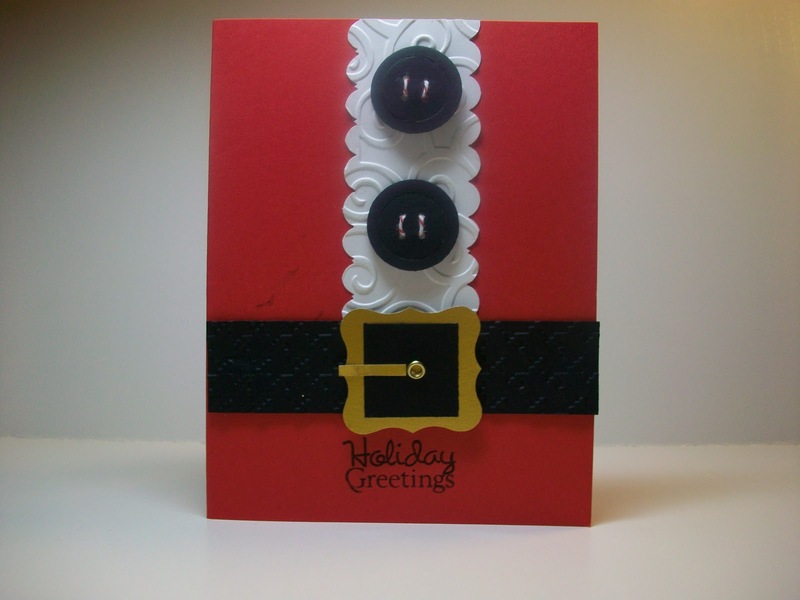 I completed the card by adding measuring tape ribbon ad several button embellishments. Isn't this an awesome album cover? 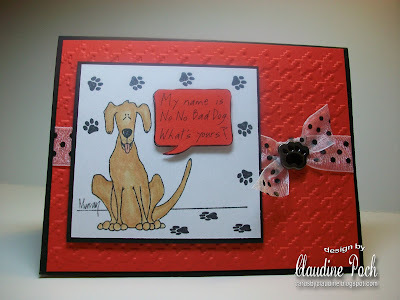 For my card, I used a Cuttlebug embossing folder for the white panel. 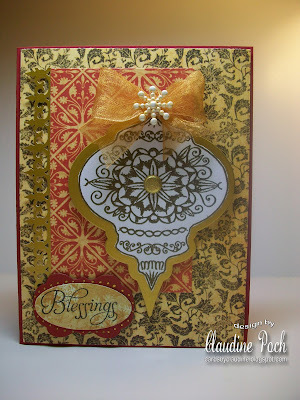 I used the Spellbinders heirloom ornament dies and coordinating stamps from Our Daily Bread Designs for the ornament. 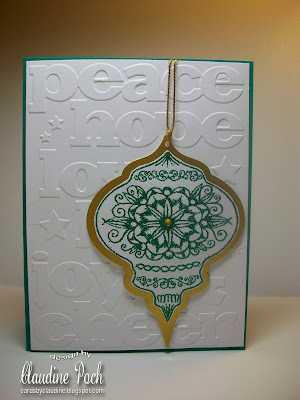 I embossed the ornament with glittery green embossing powder. Very quick, easy, and elegant! My third card today.. 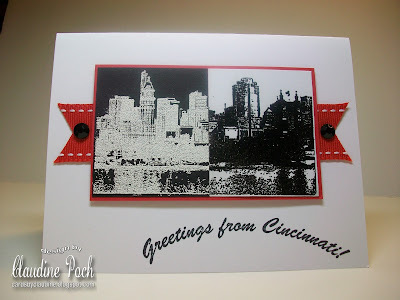 I made this card for two challenges: Stamp TV-shimmery background and CC302 at Splitcoastampers-black, white, and red. To make the shimmery background, I added embossed the white panel with a Cuttlebug embossing folder then embossed it with white diamond embossing powder. In shines more in real life than in this photo. The girl stamp is from Stampin Up's "Greeting Card Kids" set and the sentiment is from Mark's Finest Papers. I made this card for two challenges: F4A44 at Splitcoaststampers. We were to use a patterned paper, brad, ribbon, and punch. 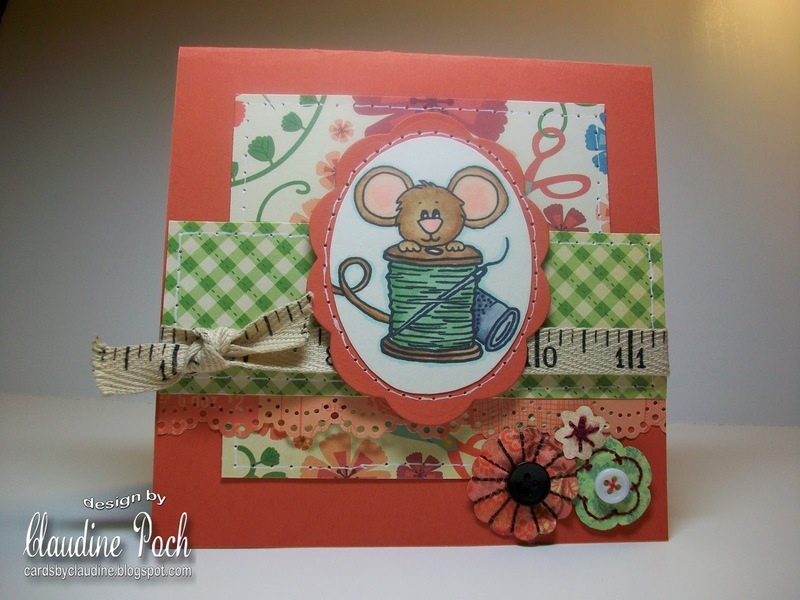 I also made this card for the challenge at Stamp TV where we were to add a button to a bow. I decided to use a shank-type snowflake button on my ribbon. The stamps used are from Our Daily Bread Designs. The patterned paper is from Graphic 45. I made this card for a Faux Window technique challenge at Stamp TV. I've never done a faux window, so I thought I would give it a try. 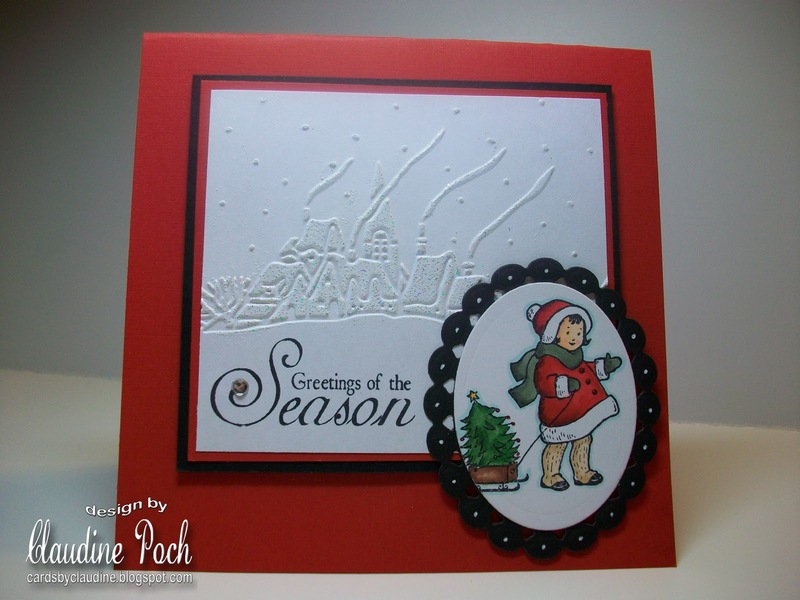 Rather than stamp the window scene, I decided to use a Cuttlebug winter scene embossing folder. I added a glitter strip at the top made with a Martha Stewart icicle punch. 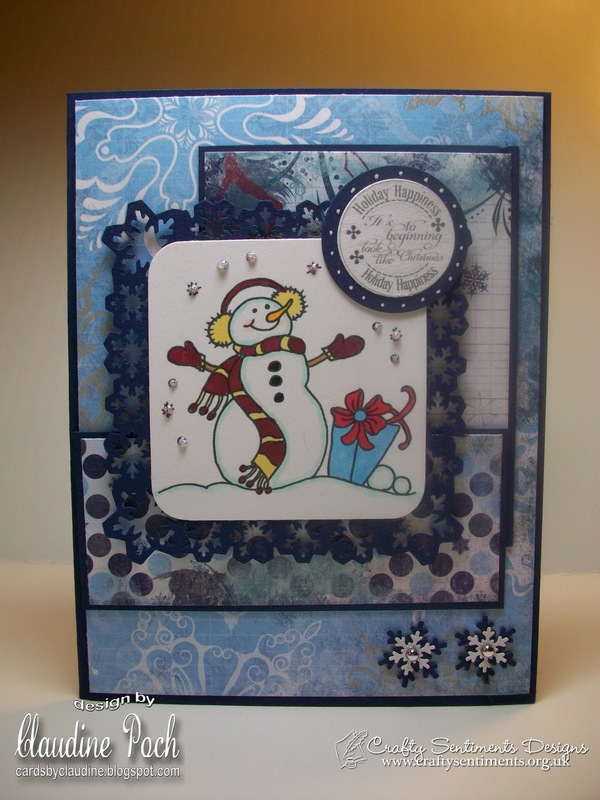 I completed the card by adding a snowflake and a sentiment by Mark's Finest Papers. I made this card for a sketch challenge at Hand Stamped Sentiments (HSSSC47). The stamps I used are from several stamp sets by Mark's Finest Papers. I stamped the tree then added Stickles for the snow and ornaments. The snowman was stamped then colored with Copic markers. 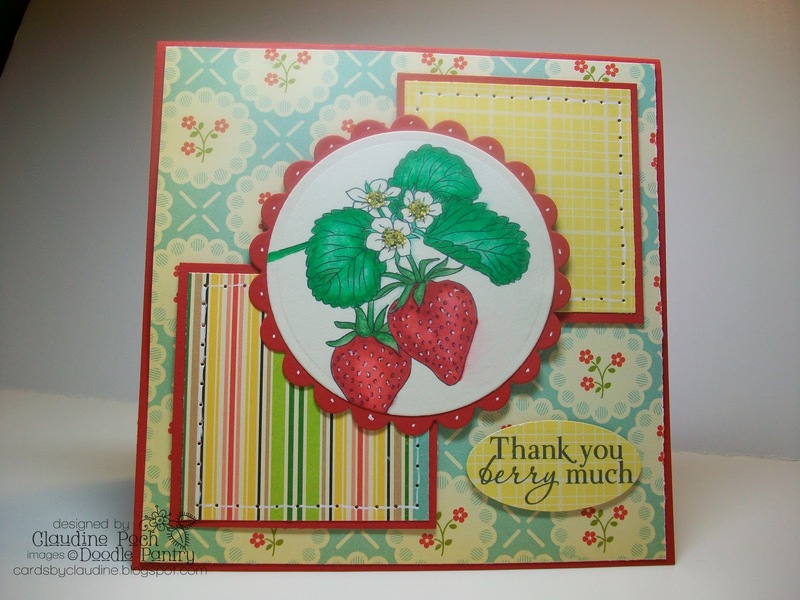 The papers used are Cherry Cobbler from Stampin Up and patterned papers by Cosmo Cricket. 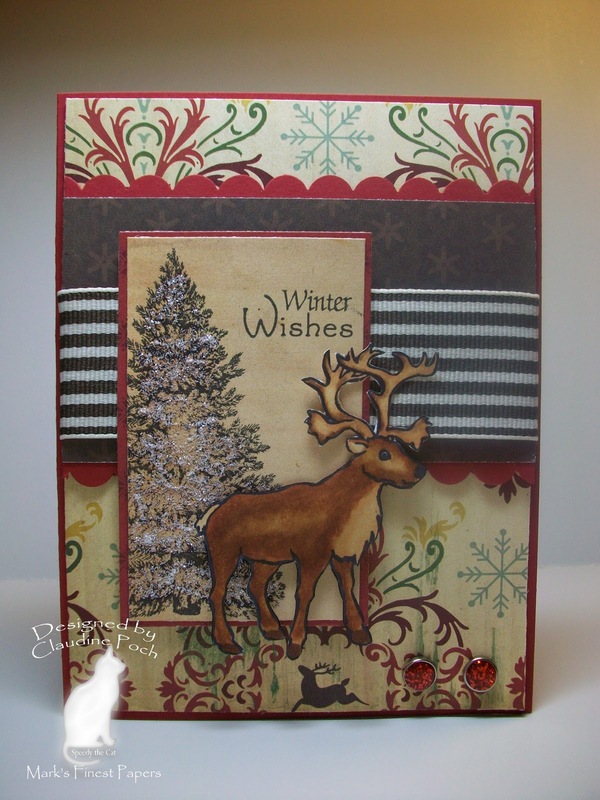 I completed the card by adding a snowflake border made with a Martha Stewart punch. I was previously on each of these design teams. Hello to all of the design team members that I previously worked with! 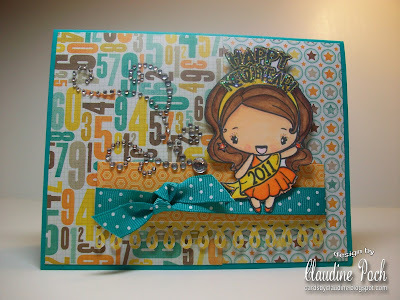 I made this card for Sketch Challenge 312 (SC312) at Splitcoaststampers. The stamps are from different stamp sets by Mark's Finest Papers. I love this buck stamp! I enjoy seeing deer, especially in the Winter. Tonight I saw five of them in someone's front yard down the street. I colored the buck with Copic markers then cut him out. I stamped the tree then added Stickles for the snow. 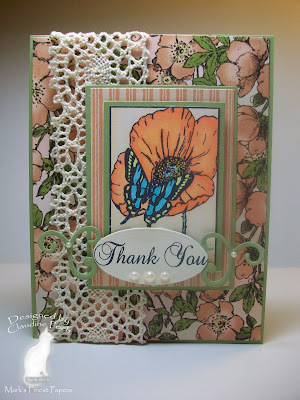 The papers used are Cherry Cobbler from Stampin Up and patterned papers by Cosmo Cricket. I completed the card by adding glitter brads and ribbon from Stampin Up. My son wanted to make some last minute Christmas cards for his teachers. Today, I saw a card on Splitcoastampers made by "mbrcutie25." We decided to replicate her card and this is what we came up with. With the proper punches and embossing folders, this card is fast and easy. We made three of them and they took us no time at all. My son even took the picture of the card. For this card, I used a sweet birdie image and sentiment from the Doodle Pantry. I colored the birdie with Copic markers then added some glitter on her wings and hat flower. The papers used are Groovy Guava from Stampin Up and Graphic 45 patterned papers. I used Martha Stewart punches for the background panel and a Cuttlebug dot embossing folder for the frame shape. I completed the card by adding Groovy Guava ribbon, the sentiment, and a few heart-shaped half pearls. 1. Splitcoaststampers WT301- all that glitters. Today there is a new challenge at the Crafty Sentiments Challenge Blog. 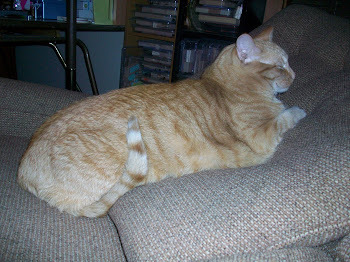 Today's challenge is: anything goes. Head over to the blog to view the details of the challenge. While you are there, be sure to check out the beautiful projects made by my fellow design team members. 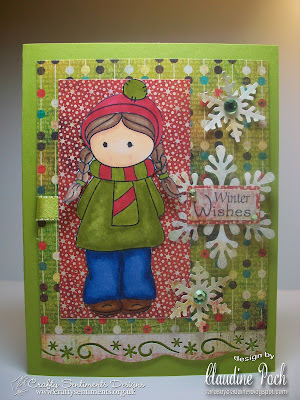 For my card, I used one the winter Amy stamps from Crafty Sentiments. 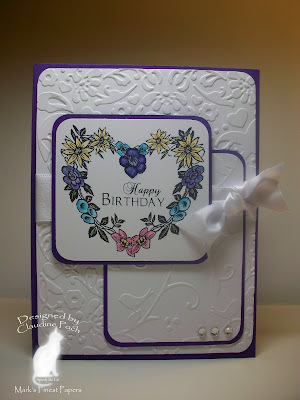 The papers used are Kiwi Kiss from Stampin Up and Basic Grey's Jovial paper pad. 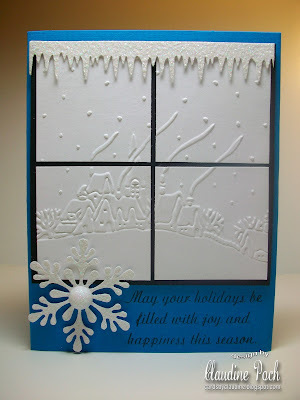 I used a Fiskars snowflake border punch and two Martha Stewart snowflake punches. I completed the card by adding a sentiment from Mark's Finest Papers, a piece of Kiwi Kiss ribbon, and rhinestones. I made this card for sketch challenge STVSKSP6 at Stamp TV. The Oliver stamp and sentiment are from The Greeting Farm. I bought this stamp a few months back, but am just now getting a chance to use it. Isn't he so sweet with his little pup? The papers are blue and burgundy card stock, and DCWV patterned papers from "The Guy Stack." I did some paper piecing in each corner then added a piece of ribbon and bone brad. I made this card for two challenges: CAS97 at Splitcoaststampers. It was a clean and simple sketch challenge. I also made this for Speedy the Cat's Friends #33 challenge-paper piecing. I used the "Seasonal Poinsettias" stamp set by Mark's Finest Papers. 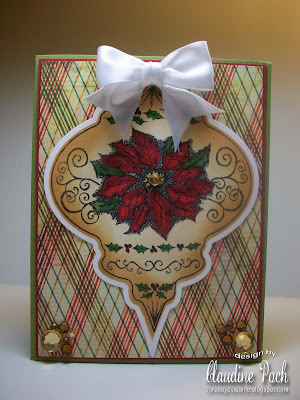 I stamped the poinsettia three times onto patterned paper. I then cut and layered the poinsettia. I completed the card by adding the sentiment and silver half-pearls. 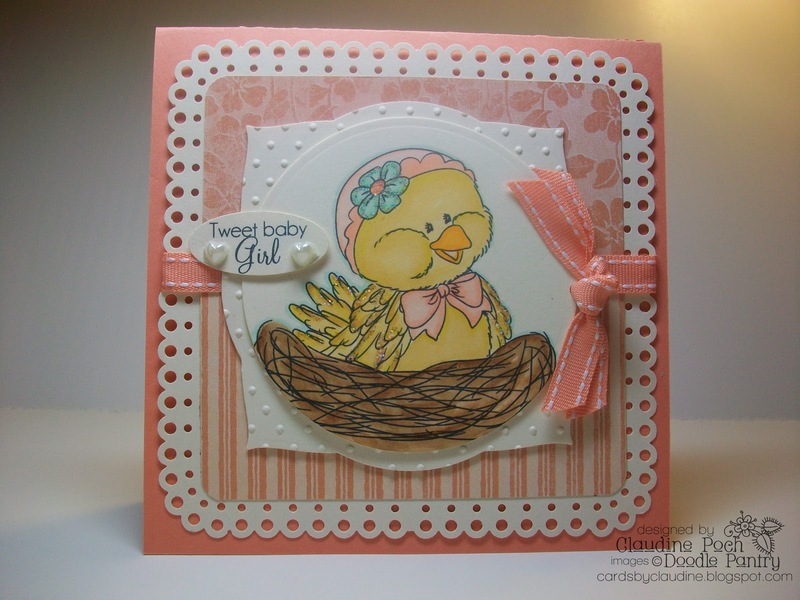 I made this card with an Olivia stamp and sentiment from the Greeting Farm. I got this stamp set awhile ago, but am just now using it. Isn't Olivia sweet holding her little kitty? I colored Olvia with Copic markers and used Tim Holtz distress inks around the edges of the paper. The papers used are Late Afternoon Sun by Mark's Finest Papers, and patterned papers by Cosmo Cricket. I also used lace by Mark's Finest Papers, half pearls, and a swirl die from Sizzix. 1. Stamp TV sketch challenge STVSKSP5 I just joined Stampin TV. It is a cool forum with many interesting challenges and stamping ideas. 2. 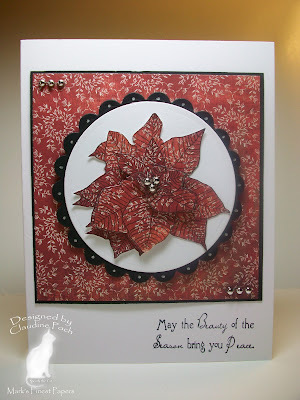 Stampin B's #88-use a star on your card. Olivia has stars on her scarf and dress. 3. 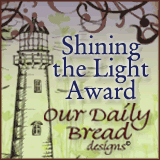 Stampin Sisters in Christ #69-make a card to encourage, compliment, or uplift. I think the quote on my card says it all. 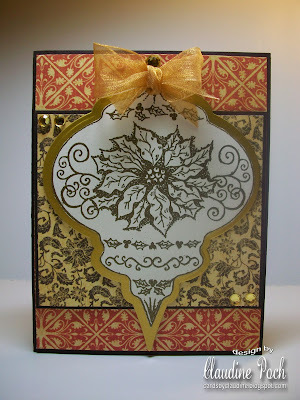 For my card, I used the new vintage ornament stamps that coordinate with the Spellbinders ornament dies. I just love these stamps! They are so elegant! 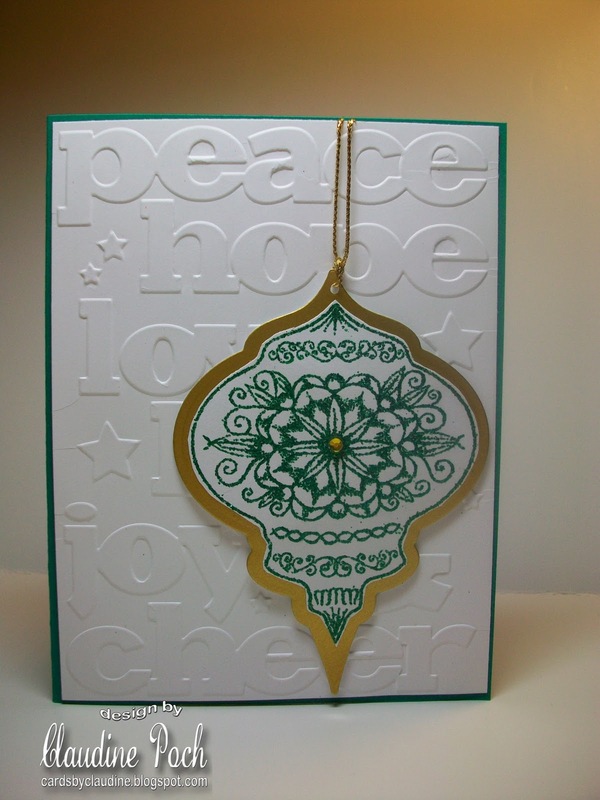 I stamped the ornament in Versamark then embossed in with gold embossing folder. I cut around the edges then used a Spellbinders die for the gold panel. The papers used Deepest Mahogany, Corn Husk, and gold from Mark's Finest Papers, and patterned papers by Graphic 45. I completed the card by adding gold rhinestones and ribbon. Because this was a quick and easy card (15 minutes), I am entering this in the F4A42- Christmas cards on the fly challenge at Splitcoaststampers. I made this card for SC209 at Splitcoaststampers. I'm trying to make the last of my Christmas cards. 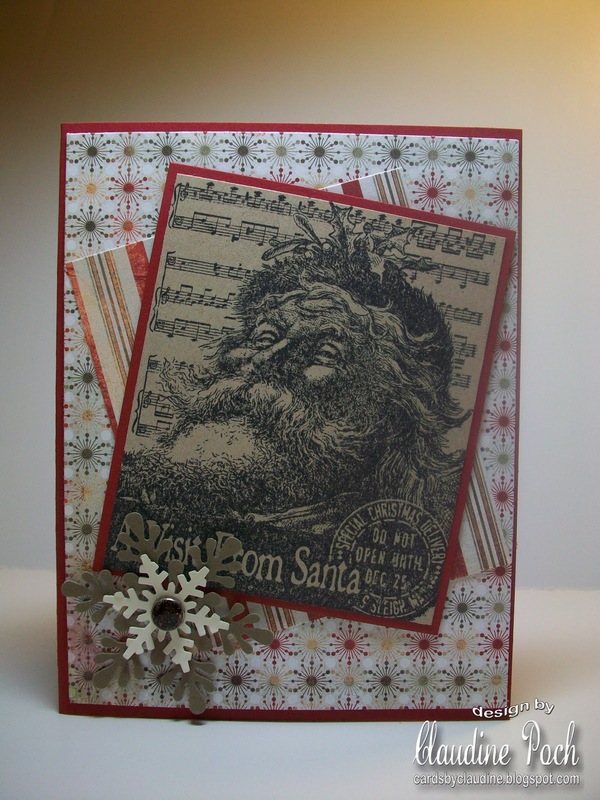 For this card, I used a Santa collage stamp from Inkadinkadoo. The papers are Crumb Cake and Cherry Cobbler by Stampin up, and patterned papers from Basic Grey. I finished off the card by adding a brad and snowflakes made with Martha Stewart punch. Fast and easy! 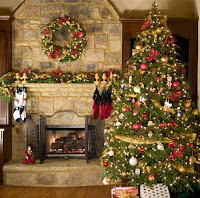 Welcome to the MFP December Blog Hop! This month, we are releasing 4 NEW SETS! We have 4 New Stamp Sets Released: Hearts, Hearts, Hearts, Nature's Postage Due; Hello Sunshine and Take a Peek. For your convenience, all 4 stamp sets are available for purchase TODAY! For your chance to win BLOG CANDY, (a set that will be released NEXT month), visit and comment on each of the following design team members' blogs TODAY. 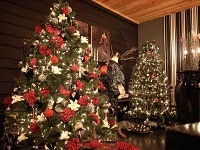 On Saturday, (December 11, 2010), a winner will be chosen from those participants who visited all the blogs listed for today. (There will be four different winners, one winner for each day of the blog hop. You DO NOT have to comment every day. However, the more days you comment, the more chances you have to win!) If you miss a day, you can go back and comment on each day's blogs, as the winners will be chosen Saturday morning. 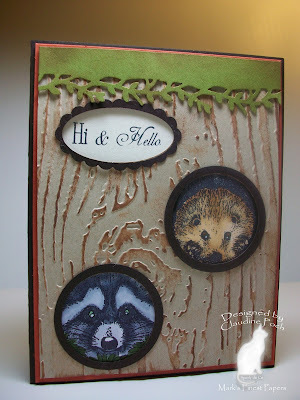 When I saw these cute woodland creature stamps, I couldn't resist having them "peek out" of a tree. I embossed a piece of Desert Sand card stock from Mark's Finest Papers, punched out two circles and an oval, ran it through a Tim Holtz wood embossing folder, then rubbed several brown ink pads over it. I colored the creatures with Copic markers then mounted them and the stamped sentiment behind the "wood" panel. The other panels used are Cajun Craze by Stampin Up and Deepest Mahogany by Mark's Finest Papers. I completed the card by adding greenery made with a Martha Stewart punch and punched rings around the knotholes. Be sure to check the Mark's Finest Papers blog tomorrow to see the blog hop winners. 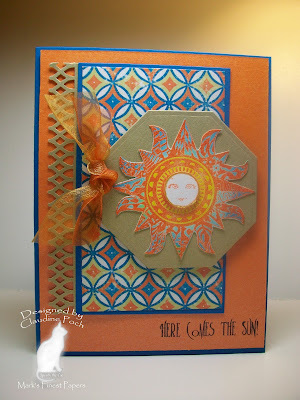 To compliment the sun stamp, I wanted to use bright and summery colors for this card. The papers used are Pacific Point from Stampin Up, shimmery gold and tango from The Paper Company, and Mediterranean Summer patterned paper. I embossed the sun then sponged it with Tim Holtz distress inks. I cut out the face, applied gold Smooch on the edges, then popped it up. I stamped the sentiment with Staz On ink, as the mango paper is somewhat slick. I completed the card by adding shimmery ribbons and a gold border made with a Martha Stewart punch. The stamp set, Tim Holtz distress inks, Smooch, and Staz On ink are all available at Mark's Finest Papers. Be sure to join us tomorrow for the fourth and final day of the blog hop! For my card, I wanted to show that you could use these "Nature's Postage" stamps without making them look like postage stamps. It makes them more versatile. I stamped the image, colored it with Copic markers, then cut out the postage stamp edge portion of the stamp. I covered up the 55 with the tag. The papers I used are Pear Pizazz from Stampin Up and new patterned papers from Graphic 45. 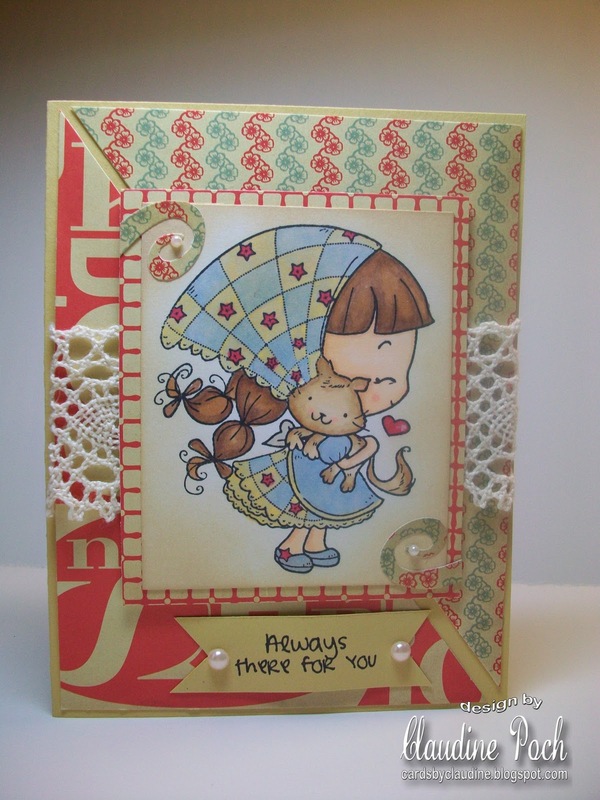 I used a Nestabilities tag die for the sentiment and added a few half pearls. The beautiful ribbon is from Mark's Finest Papers. I completed the card by adding a small amount of glitter to the center of the flower. Make sure to join us tomorrow for day 3 of the Blog Hop! I wanted my card to have a clean and crisp look. I stamped the flower wreath and sentiment onto white card stock, then colored the wreath with Copic markers. 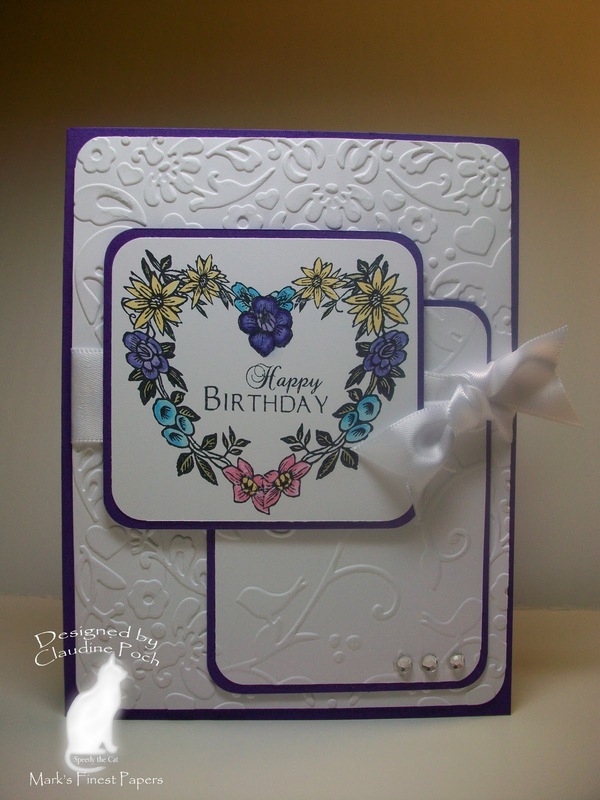 I used layers of white and Mamma's Favorite Purple card stock by Mark's Finest Papers. 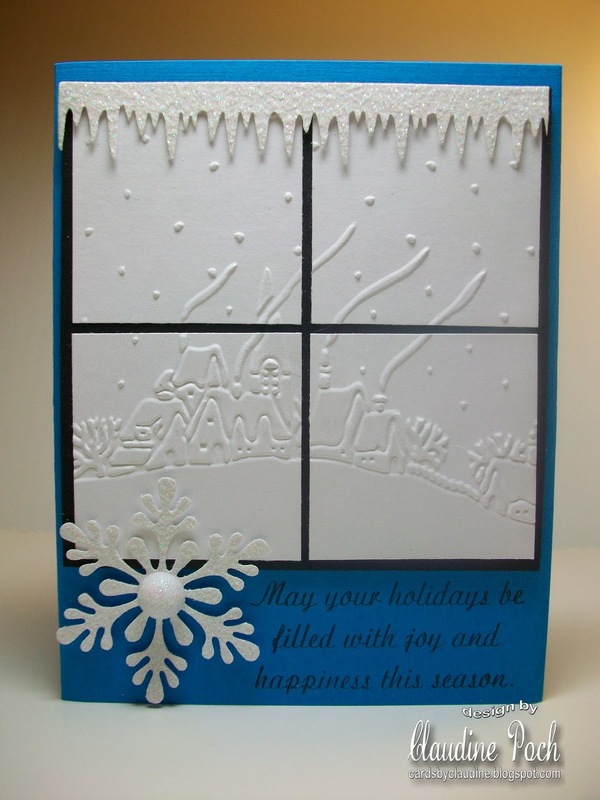 The white layers were embossed with two different Cuttlebug embossing folders. I completed the card by rounding the corners and adding rhinestones and a bow made with satin ribbon. The "Hearts, Hearts, Hearts" stamp set, card stock, ribbon, and Copic markers are all available at Mark's Finest Papers. 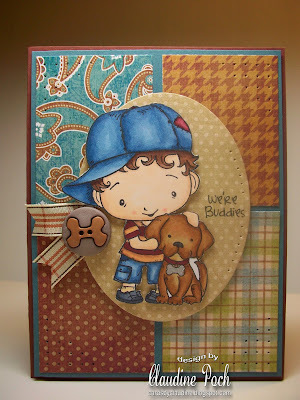 Head over to the Mark's Finest Papers blog to see today's blog hop line-up. Make sure to join us tomorrow for day 2 of the blog hop! The Doodle Pantry has a new blog and two new challenges a month. Today is the start of a new challenge. All you need to do is to create a card using a Doodle Pantry image. 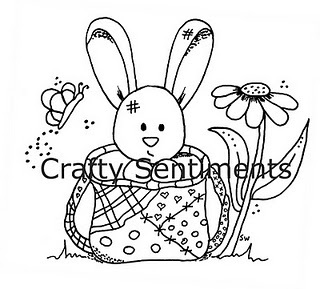 Head over to the Doodle Pantry blog to see all the challenge details and to see the new digital releases. 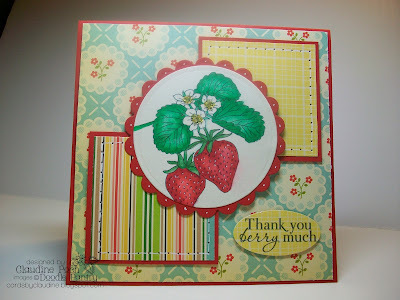 I made this card with the new strawberry image and sentiment from the Doodle Pantry. I colored the strawberries with Copic markers then highlighted the seeds with a white gel pen. While it may not show in the photo, I added a few micro beads to the center of the strawberry flowers. The papers used are Real Red from Stampin Up and patterned papers from October Afternoon. I completed the card by adding a sentiment and faux stitching around two of the panels. I could have done real stitching, but didn't feel like getting out the sewing machine. That's one of the joys of faux stitching on cards! I made this card for several challenges: F4A41 and IC261 at Splitcoaststampers and Challenge #31 at Speedy the Cat's Friends. 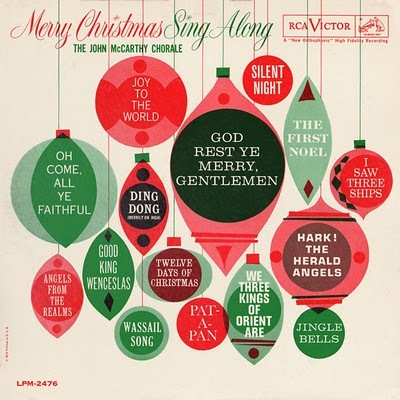 The nutcracker stamp is from the "Christmas Postage Due" set by Mark's Finest Papers. I had my son in mind when I purchased this nutcracker paper last year, as he has a large collection of nutcrackers. 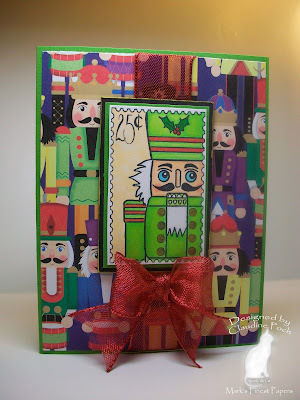 I stamped the nutcrackers, colored it with Copic markers , then highlighted it with gold Smooch. To complete the card, I added a pretty red bow. I made this card for IC261 at Splitcoaststampers. I was inspired by a glass dog ornament. This cute stamp is from American Art Stamp. I just love the quote this quote! I stamped the image then colored the doggie with Copic markers. The background panel was embossed with a herringbone embossing folder. I completed the card by adding a ribbon and dog brad. Today there is a new challenge at the Crafty Sentiments Challenge Blog. Today's challenge is to make a card about new beginnings. This could be a new job, new baby, new season, etc. Head over to the blog to view the details of the challenge. While you are there, be sure to check out the beautiful projects made by my fellow design team members. 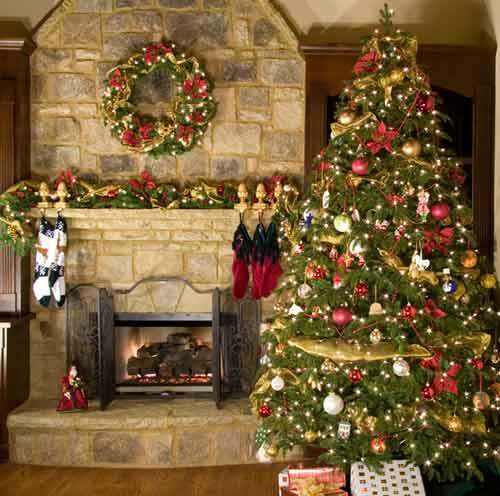 For my card, I chose to celebrate the beginning of winter and Christmas. The sentiment on the card says, "It's beginning to look like Christmas." The sentiment and the snowman image are from Crafty sentiments. I made a frame with Martha Stewart snowflake punches to use behind the snowman. The papers used are Night of Navy by Stampin Up and patterned papers by Bo Bunny. I completed the card by adding Stickles for the snow and a few punched snowflakes.